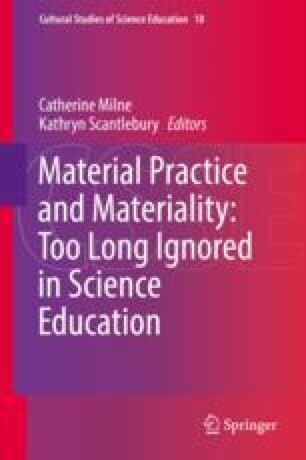 In this research study, we engaged in experimentation with materiality in an attempt to explore how sociomaterial perspectives can inform theory and practice in equitable science education. This study took place in a biological science-focused asynchronous learning environment which consisted of a collection of technological tools designed for students to fully participate in science practices outside of a face-to-face or laboratory setting. We explored the data using theoretical perspectives that were new to us and helped us shed light on the intertwined roles of materials and humans in online learning in terms of equitable science assessment practices. Our work provided an opportunity for researchers and instructional designers to examine the social and material dimensions that affect learners in technology-enhanced science learning environments and address potentially oppressive sociomaterial assemblages.